Peafowl are members of the pheasant family and the group includes peacocks, peahens and peachicks. The males of the species are well-known for their impressive feather displays; any cages for these birds need to take into account the size of the male’s train. Since peafowl prefer to roost as high as they can at night you’ll also need to cover the cages or the birds will be out from the start. House them in groups to keep their social interactions as natural as possible. Choose a sheltered spot that offers the birds some protection from the elements along with some natural cover and forage such as bushes and grass. The place you pick should have a building so that the birds can get out of the sun and away from the cold if they need to. You can add a three-sided shelter if there’s nothing available. Lay out the cage by marking the boundaries with string, a long garden hose or spray paint. Allow at least 100 square feet per bird. 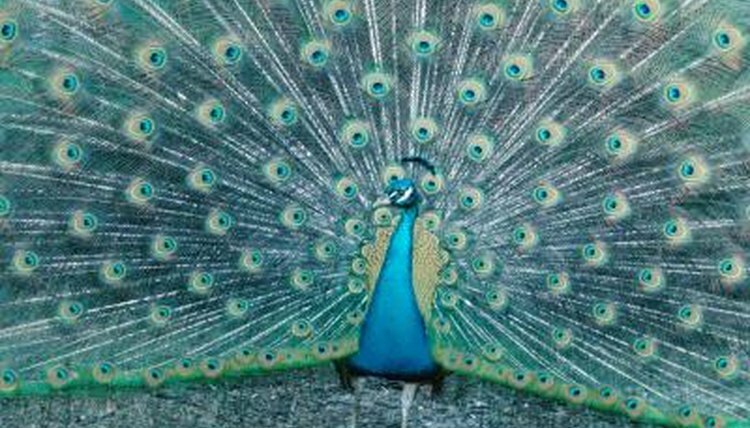 Peafowl will thrive in small groups containing one male and up to five females; plan your cage size accordingly. Set wooden fence posts 18 to 24 inches into the ground at every corner and on both sides of the gate opening. The posts should extend at least 5 feet above the ground so the peacock can display his train without hitting the top of the pen. Add extra posts every 10 feet along the fence line for stability and security. Dig a 12-inch deep trench along the fence line. Set field fence into the trench. Lay chicken wire over the lower part of the field fence so that the fence is strong enough to keep out predators and has the small holes common to chicken wire. Attach the two layers of fence wire to the posts all the way around the perimeter of the cage, pulling it as tightly as possible as you go. Use a fence stretcher to pull the wire tight for best results. Hold the wire in place by hammering in fence staples about 6 inches apart from the top of the post to the ground. Hang the gate from one of the wooden fence posts. Install the latch by screwing it to the post on the other side of the gate opening. Stretch chicken wire over the top to discourage winged predators and to keep your peafowl from flying out in the evening. Install 2-by-4 boards in the corners of the pen, inside the shelter and in other locations within the pen to provide roosts for your peafowl. Place the roosts as high off the ground as possible so that your birds will feel safe while they sleep. Fill in the trench around the bottom of the fence to stop predators from digging under the wire. Add food and water dishes to complete the cage.  Add heat tape to the roosts to keep the birds’ feet from freezing in the winter. This type of tape is made to keep pipes from freezing and is available at hardware stores and home centers. ⚠ If you have male and females birds they’re likely to hatch out some peachicks unless you gather the eggs often during nesting season. If you want them to raise chicks add a nest inside their shelter to give them a safe place to brood their eggs.